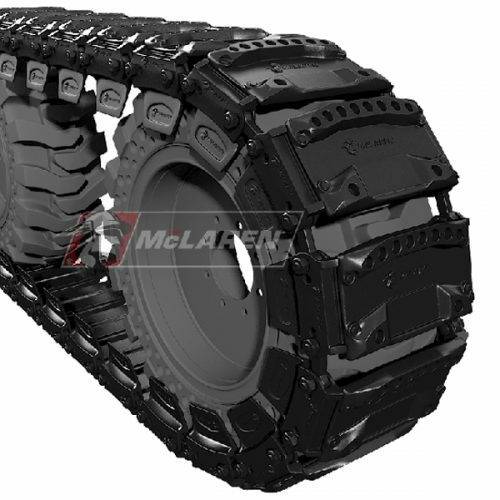 The McLaren Steel Maximizer Over The Tire Tracks for Advanced Traction on Mud, Sand, Gravel, Snow, Ice, and Slippery Surfaces. 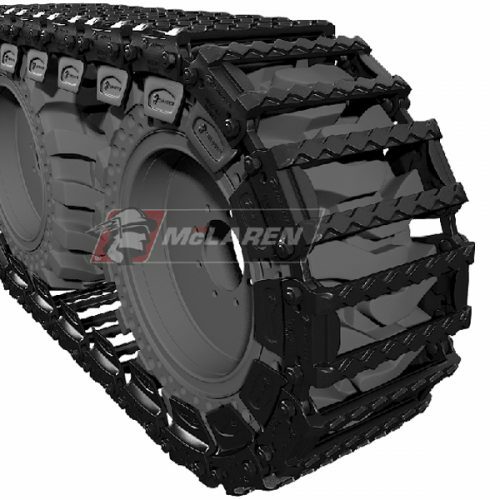 Just like the Diamond OTT tracks, McLaren’s Maximizer OTT tracks also offer maximum traction but at a fraction of the cost. It’s hexagonal tread pattern allows it to bite into wet and slippery ground surfaces like snow and ice. Maximizer OTT tracks are designed for part-time use and are essentially a lighter version of the Diamond OTT track system. They are cheaper which makes them a great cost-effective solution for your projects that require a tracked equipment. But don’t be fooled by the lower price – Maximizer OTT tracks are tough and reliable, made of the same strong steel alloys as other McLaren OTT tracks. 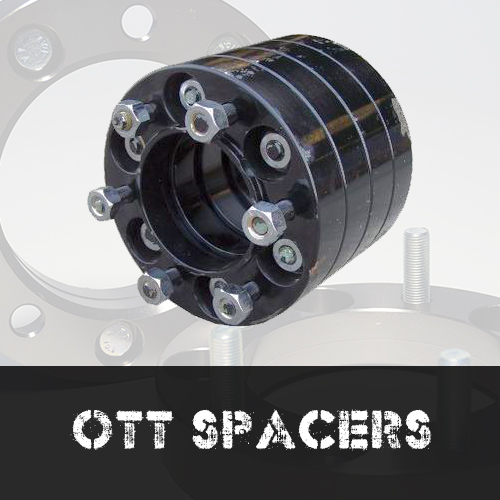 They provide superior traction at the lowest possible cost! 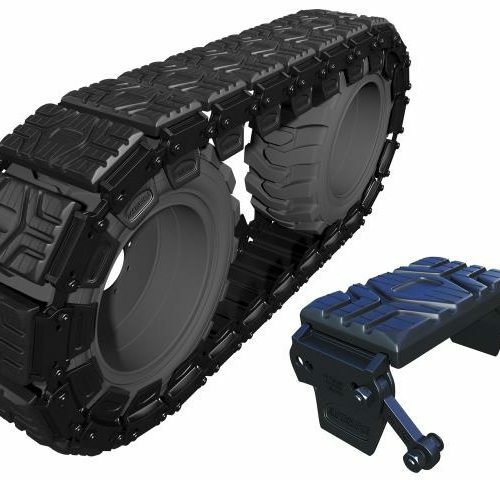 By lowering the center of gravity of your skid steer, Maximizer OTT tracks make your skid steer much more stable as it navigates different terrains while providing maximum traction on slippery surfaces. To enjoy a smooth, stable ride on surfaces like sand, clay, mud, loose stone, snow and ice, equip your heavy equipment with this tough, dependable over-the-tire track system. For those problematic sloped or hilly terrains, this is the go-to track for your skid steer. The hexagon-shaped track pattern on the sidebars allows it to grip firmly on to sloped or hilly surfaces, keeping your skid steer in balance and on track. All Maximizer OTT track systems come with an easy-to-use installation kit as well as an accompanying user guide and manual that gives you straightforward directions on how to install and remove the tracks as needed. Within a matter of minutes, your skid steer can be transformed into a powerful, high-performing tracked equipment! You don’t have to worry about replacing the entire track system if one of its components wears out or becomes faulty. Maximizer OTT tracks are fully rebuildable and you can buy a replacement link or other section of the track from Monster Tires. This reduces your overall operating costs as you can avoid spending extra money replacing an entire track – which can cost you a lot. Just contact one of the trusted staff at Monster Tires for high-quality replacement parts for your track! It’s not unusual for pesky debris to get lodged and stuck in crevices of some track systems, which in turn can damage your skid steer. With Maximizer OTT tracks, however, you can be sure that debris doesn’t get stuck as it is specially designed to self-clean. This is due to its innovative self-cleaning hexagon surface, crossbar design. 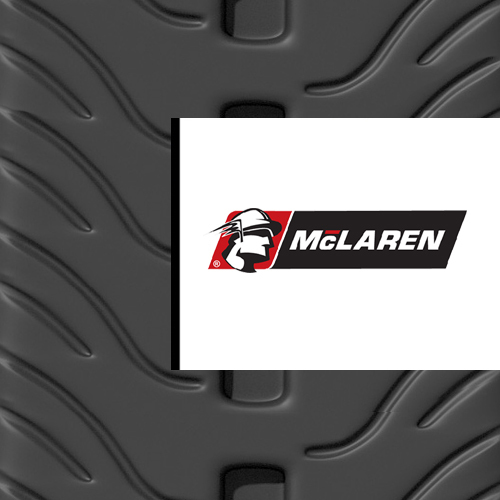 For the best performance, pair your Maximizer OTT track with McLaren’s Nu-Air Tires. Maximizer OTT tracks are compatible with a wide range of popular skid steer models and makes including Bobcat, CASE, Caterpillar, John Deere, JCB and many others. Call Monster Tires today to get hooked up with very affordable, high-quality Maximizer OTT tracks!